Putting a pull-up workout plan together may be a bit of a tedious process. Often times, people starting out are very motivated about working out and want to try everything they see or find out. However, training without a structure of sorts may not the best way to go about things. There is a lot of information on the web these days and talking to people can help to get you started but all the information may be somewhat overwhelming and even confusing. When are you supposed to apply this or when should you do that exercise? These can be some of the questions you ask yourself in the beginning. 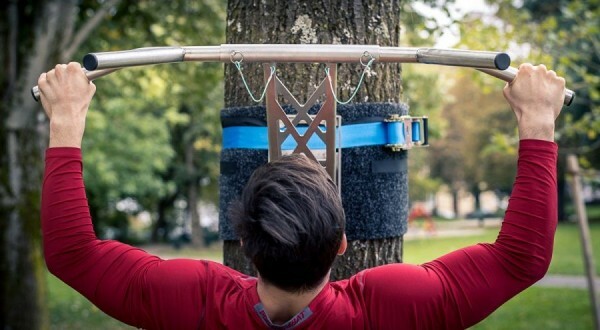 Thus, in this article we are going to discuss a simple pull-up workout plan you can implement which is fully adaptable to your own individual capabilities. We will be covering areas such as training frequency, pull-up variations you can try whilst also giving you useful tips to keep in mind when working out. Improving your upper-body strength by doing pull-ups means that you will be training regularly. While it is not recommended to do an insane amount of reps, it is very much ideal to put all your effort into those reps you do during every workout session. If one set is all you can do then make sure you really get the most out of the exercise and your reps. Don’t do half reps or ‘cheat’ your way into doing reps as you would be doing yourself a disservice. Increase your sets from one to two per pull-up workout once you feel capable of doing so. If you continue, you will most definitely see some results after eight weeks compared to when you first began with the pull-up workout. Once you have gotten the hang of things in the first couple of days of your new pull-up workout, try adding some pull-up variations. 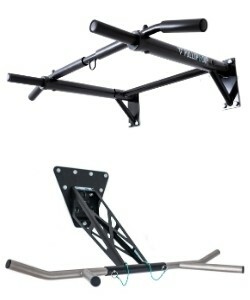 Note that pull-up variations come in different ranges of difficulty. To add these to your pull-up workout, start out with a regular set of pull-ups and do a second or third set of pull-up variations techniques afterwards. We have listed a few below that are easy to mid-level in terms of difficulty. Weighted pull-ups involve the usage of weights in your pull-up workout. This variation can be performed by adding weight plates to your body and is relatively easy to adopt as you have the option to add or remove more weight from the weight belt. Start by adding little weight to your body and gradually add more as you do more reps per workout session. It is important not to add too much when you start out with this variation as it may do more harm than good if your body is not fully accustomed yet to the additional weight and strain on it. The L-sit pull-up involves both your upper-body and legs. To perform these, grab the bar with both arms and raise your legs up, which turns your body in the shape of an ‘L’. Once you are in this position you can start doing your regular reps of pull-ups. The key point of this variation is to keep your legs fixed in this L position whilst focusing on your reps. 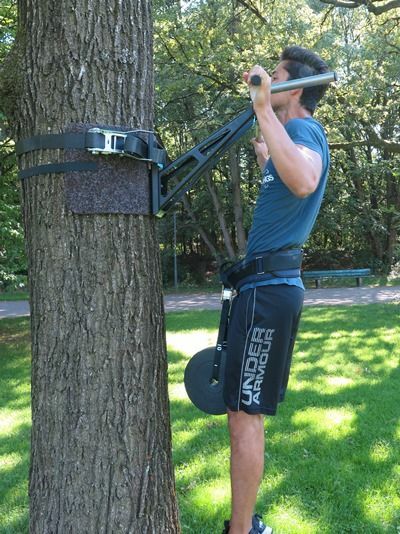 It adds an additional level of difficulty to things but if you are comfortable doing several pull-ups during one set, then it may be the right time to try L-sits. This pull-up variation makes it so that you move your body similar to an old-fashioned typewriter. To perform one you start by hanging from the bar and pull your body up to one side only. For example, say you start pulling on your right side, you would pull your body up to the right and them move horizontally over the bar to the other side (with your chin over it) and pull yourself back down from the left. In doing this variation you isolate your muscles more and strengthen them. While doing a typewriter pull-up you can choose to lift your legs similar to an L-sit, imitate a bicycle-pedaling motion with your legs, or simply lift and bend them in order to focus on your upper-body only. Doing around the world pull-ups is a simple variation to try out when including variations in your pull-up workout. To perform one, simply get into a hanging position on the bar and perform a rotating movement from one arm to the other back down to the base position. It is somewhat similar to the typewriter pull-up we covered, with the main difference being the added rotation. This technique is done much quicker. Moreover, you can also try doing a full rotation and follow-up with a reverse rotation afterwards. These can be considered as two reps. 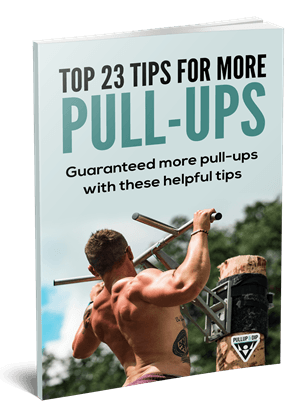 Looking for more advanced pull-up variations? 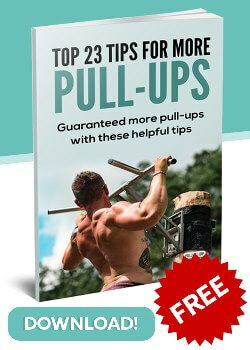 Then check out our article "Pull-Ups fro pros - 10 more advanced pull-up variations." As we mentioned early on, it is important to know your limits before undergoing any sort of training. Once you have accepted this you can work on improving things step by step. Another useful tip is to do rope climbing or simply hang from the bar for a couple of minutes. This can help you build some serious grip strength on the pull-up bar, which is essential for doing pull-ups. Also, if you are jus starting out, try to include some different back strengthening exercises in your regular workout (see also our article "Top 5 assisting exercises for more pull-ups". You can try doing lat pull-downs, ring rows and even (single-arm) dumbbell rows. Doing two or three sets of 15 reps each should give you a stronger back in order to start with your pull-up workout. The use of pull-up bands especially as a beginner or advanced also helps you to do more pull-ups. Next, make sure that you are using a proper technique when doing pull-ups. This means that you keep you head up at all times in order to involve your back muscles more and that you avoid using a wide grip on the bar – a shoulder width grip is recommended. Furthermore, if you feel that you have too much weight then start there first. Lose some weight and start working on your back muscles to then kick things off. Once you start, remember that you need to practice frequently. Knowing your limits early on is very important for adopting a pull-up workout plan. Make sure that you are able to determine the amount of reps you can do. From there, increase the reps (and to a lesser extent, intensity) of your sets. For the first eight weeks, try to keep things at one set per workout day. Having a fixed time to workout can also help in creating a kind of routine and commitment. Lastly, it is good to remember that results come from being committed to what you do. Adopting a pull-up workout plan is one step, but staying committed to the plan is an even more critical step. What we have outlined in this article can be adopted by anyone aiming to do some serious pull-ups at their own pace and based on their capabilities. It is never advisable to force your body to do more reps when your limits are clear. Instead of doing this, gradually increase your strength which will allow you to endure more physically intense pull-up workouts. This will make for better built muscle and improved physical strength in your upper-body. Good idea to add some variations into the plan after some weeks, haven't seen all of them yet. What exact plan would you recommend for beginners who are reaching plateaus?